Brendan Fowler/BARR is a twenty six year old a "public speaker" who just got off of tour with Tracy+ The Plastics and The Quails. He has shown and performed at Deitch Projects in New York; The CAC in Cincinnati; The Mu Foundation in Eindhoven, Holland; Jack Hanley Gallery in San Francisco; The Alleged/Annex, New Image Art, and RedCat Gallery at Disney Symphony Hall (with Georganne Deen) in LA; and countless rock clubs and living rooms all over the country. This fall he will have a solo show at Golinko&Kordansky in Chinatown. This show is in honor of the release of his first full length album, "what would the second barr" on Tapes/DoggPony records. also performing will be Brendan's former Dogg+Pony mate, Isaac Ramos in his new band, Bad Waste (think Black Dice with engaging vocals); co colaborator (along with Le Tigre's JD Samson) in New England Roses, Sarah Shapiro; and Dim Diamond. 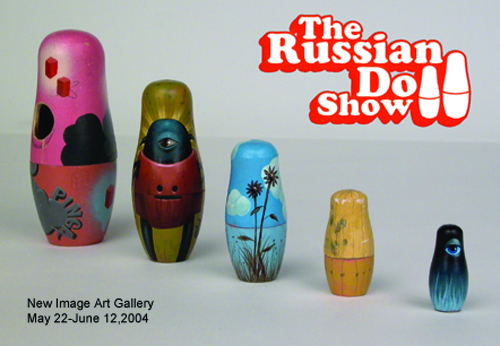 A travelling group exhibit of nesting dolls painted by contemporary artists from across the country. Russian Nesting dolls ( or Matryoshka dolls ) combine beauty and intrigue. 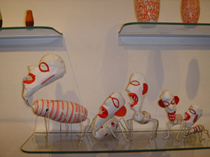 They lead two very separate lives, one as little statues on display, the other as interactive toys; each one opening up revealing a smaller one inside, creating a family of pear shaped characters. 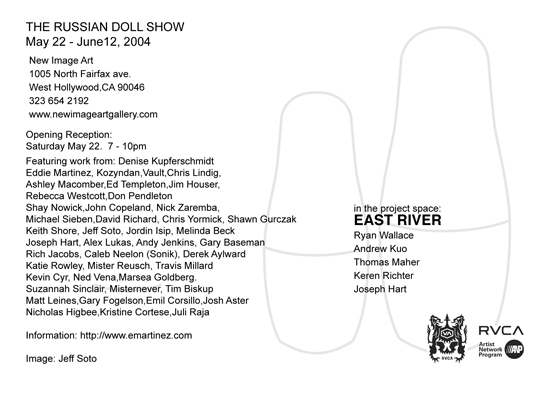 The idea for this show resulted from the discovery that the dolls could be purchased in their raw wood state, unpainted. 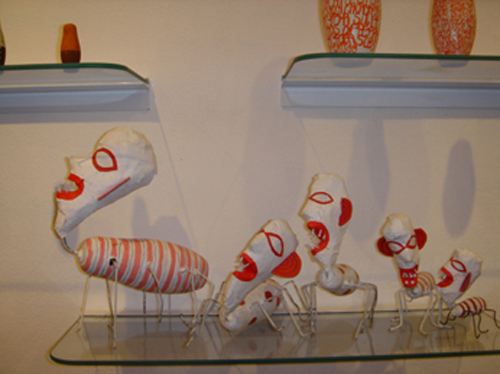 The challenge was to encourage artists who typically work 2- dimensionally to cross over to 3-dimensional work. The artists selected to participate in the show were chosen based on their artistic merit and enthusiasm. 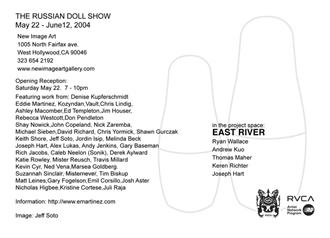 I also looked for work that lends itself to the ideas surrounding Matryoshka dolls, such as story telling, and creating art in series. They range from commercial illustrators to fine artists, to graffiti writers, describing a wide range of styles and ideas. ©2000 New Image Art. 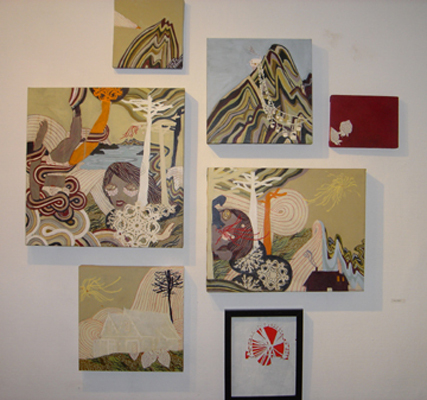 All artwork appears with permission of the artists.